Gems Range - Legacy Kettle Axinite copper. Gems Range - Legacy Kettle Axinite copper. Add atouch of fun and colour to yourkitchen with thebeautifully designed legacy kettle. Allowing you to comfortably and safely use the kettle. Specialist product architects at our reputable supplier have designed the kettle with a user friendly focus. The handle shape and position are designed to optimize comfort when holding whilst the kettle swivel base allows the kettle jug to turn 360°, allowing it to feel comfortable no matter what hand you prefer to use with ease. Bosch Cordless Fastboil Kettle 2500-3000 W Stainless steel interior base with concealed heating element for less limescale build up Removable limescale filter 360 degree base for left and right handed users Double sided water level indicator One-touch lid opening for easy filling Safety lid with automatic switch-off Illuminated on-off switch Automatic switch-off: kettle automatically switches itself off when water has boiled Lift-switch-off: The water kettle automatically switches itself off when removed from it's base Thermal cut-out Integrated cable storage 2 Year Manufacturer Guarantee. 360 ° base for left or right handed users. 1.8 L Electric Cordless Kettle Swivel base Fast Boil Washable Filter Tea Coffee . This high quality kettle has been designed by UK based professionals to be as comfortable and user friendly as can be. Specialist product architects at our reputable supplier have designed the kettle with auser friendly focus. The handle shape and position are designed to optimizecomfort when holding whilst the kettle swivel base allows the kettle jug to turn360°, allowing it to feel comfortable no matter what hand you prefer to use with ease. Breville HotCup Hot Water Dispenser, 1.5 Litre, Gloss Black. Breville's first generation hot water dispenser. Breville Hot Cup Water Dispenser, Black - VKJ142. - The Breville VKJ142 is a hot water dispenser which gives you boiling water at the touch of a button. Breville's first generation hot water dispenser. Breville Hot Cup with Variable Dispense. Instant Hot Water Dispenser Kettle. The dispenser can give you just one cup of boiling hot water, so you will not be heating more water than is needed. 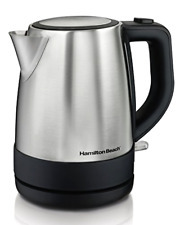 A handy touch-handle will not heat up whilst boiling, allowing you to comfortably and safely use the kettle. With your safety in mind, the kettle is equipped with an automatic shut-off function, boil dry protection, a comfortable handle plus a helpful LED indicator light. Filte Purple. Want to know how much water is in the kettle with ease?. Each kettle has. Add a touch of fun and color to your kitchen with the beautifully designed legacy kettle. Specialist product architects at our reputable supplier have designed the kettle with. Product Description Bosch TWK8631 Styline Collection Cordless Jug Kettle, 1.5 L - White ---Removable stainless steel limescale filter ---1.5L Capacity ---3Kw Cordless Styline Kettle ---Cool Touch Housing ---Four Temperature Settings The Bosch styline kettle benefits from an array of features including digital temperature settings and a keep warm function to compliment its looks and powerful 3000 W element. It has the ability to boil as little as one cup. Key features: - Four temperature settings for brewing a variety of drinks - 70 degrees Celsius, 80 degrees Celsius, 90 degrees Celsius and 100 degrees Celsius. Keep warm function retains water at the desired temperate for up to 30 minutes. Acoustic ready signal lets you know when the kettle has boiled. Both practical and stylish, this Kettle will be a useful addition to your kitchen. Below are the features ofLegacy Kettle. You do not have to give any reason for cancellation. All products are individually inspected before being dispatched, to ensure they are sent out in perfect condition. With its contemporary design and red stainless steel finish, this Breville VKJ864 Colour Collection Red Jug Kettle would make a vibrant addition to any kitchen. 1 x Breville Kettle, 1 x Instruction Booklet. The handle shape and position are designed to optimize comfort when holding whilst the kettle swivel base allows the kettle jug to turn 360°. Premium cordless kettle jug with lid. The cordless jug is designed to maximize water. Queensense Electric Glass Kettle 1.5 Liter Blue LED Illuminated Portable Office Use Pure Glass Cordless Auto Power Off Stainless Steel Quick Boil Tea Jug Kettle-Adult and Baby Safe -Double Wall -GK1501. Boil dry protection - automatically switches off when the kettle is empty. Quiet boil. Rapid boil. Blue illumination on boiling. A handy touch-handle will not heat up whilst boiling, allowing you to comfortably and safely use the kettle. With your safety in mind, the kettle is equipped with anautomatic shut-off function ,boil dry protection, acomfortable handle plus a helpfulLED indicator light. Judge 1850W Cordless Quick Boil Electric Kettle Ref: JEA38Safety locking lid. Sturdy, easy to clean casing. 1.7 Litre capacity with water level indicator. Jamie Oliver. REF: JEA38. Wrendale Mugs 6 for 5. 1.8L Electric Cordless Kettle Rapid Boil Washable Filter 2200W Black. A handy touch-handle will not heat up whilst boiling, allowing you to comfortably and safely use the kettle. With your safety in mind, the kettle is equipped with an automatic shut-off function, boil dry protection, a comfortable handle plus a helpful LED indicator light. Klarstein Aquavita Kettle 1.5L 2200w Stainless Steel Red. 2200W power. Kettle in the classic kettle-style. The combination of the cable free kettle and the cool touch handle allows you to transport the kettle with ease and without having to worry about cable lengths or burnt fingers. Add atouch of fun and colour to yourkitchen with thebeautifully designed legacy kettle. Allowing you to comfortably and safely use the kettle. - Premiumcordless kettle jugwith lid. Featuring a cordless jug withlarge 1.8 Lcapacity. Item Condition: This tea kettle has been tested and is working fine. Overall in excellent condition. Use for manually brewing pour-over coffee, tea or any hot beverage. Most kettles have either uncomfortable handles or are designed too small. Stylish Black Kettle with stainless steel highlights. Side water gauge and a on/off switch. Easy pour spouts with push to open hinged lid. 1.8 L Electric Cordless Kettle Swivel base Fast Boil Washable Filter Tea Coffee. This high quality kettle has been designed by UK based professionals to be as comfortable and user friendly as can be. 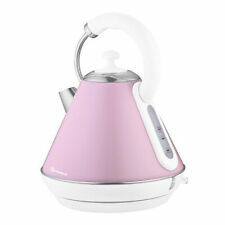 1.8L Electric Cordless Kettle Rapid Boil Washable Filter 2200W Pink. A handy touch-handle will not heat up whilst boiling, allowing you to comfortably and safely use the kettle. With your safety in mind, the kettle is equipped with an automatic shut-off function, boil dry protection, a comfortable handle plus a helpful LED indicator light. 1 X 1.8L Kettle with 360 swivel base. 360 SWIVEL BASE, CORDLESS JUG. Frequency: 50Hz. Model 21400. Model Number 21400. Type Corded Jug Kettle. 1 x Mode Kettle. Stylish Black Kettle with stainless steel highlights. Main Colour Black. Colour Black. Side water gauge and a on/off switch. Modern and functional, the stunning VonShef 1.7 Litre Glass Kettle will brighten your kitchen counter top. 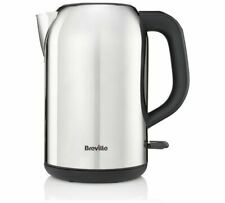 Ultra-stylish fast boil 3000W kettle with large 1.7L capacity. The kettle is equipped with fast boil technology so you’ll be sipping on your freshly made drink before you know it. 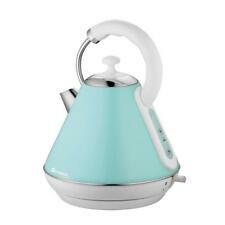 Add atouch of fun and colour to yourkitchen with thebeautifully designed legacy kettle. Allowing you to comfortably and safely use the kettle. Featuring a cordless jug withlarge 1.8 Lcapacity. - Premiumcordless kettle jugwith lid. 1.8L Electric Cordless Kettle Rapid Boil Washable Filter 2200W Purple. A handy touch-handle will not heat up whilst boiling, allowing you to comfortably and safely use the kettle. With your safety in mind, the kettle is equipped with an automatic shut-off function, boil dry protection, a comfortable handle plus a helpful LED indicator light. By Morrisons. Can be taken off as well. Boil dry protection. Cordless 360° base. Lift switch off. Auto switch off. Illuminated on-off switch. Button opening lid. Water level indicator. Overheat protection.